This is the result of the bounty of French products ordered on line from a French specialty food company. I ordered duck confit, duck rillettes, and some nice pates and chestnut preserves. I also received this lovely log of Ile de France chevre, so decided to make these baked toasts and top the salad with some duck and some goat cheese crostini. It tasted very much like Paris. First make your dressing. Whisk together the dressing ingredients in a small bowl and set aside. I used duck confit already prepared. All I had to do was cook the legs in a skillet on low heat for 6 minutes on each side in some duck fat (use splatter screen, it makes a mess!). Transfer to paper towels to blot. 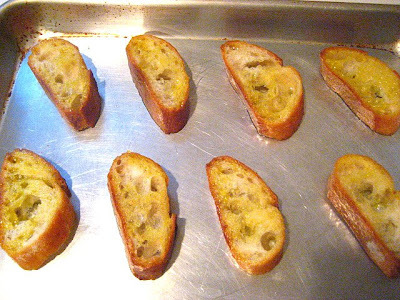 Cut your baguette into slices and place in a bowl. 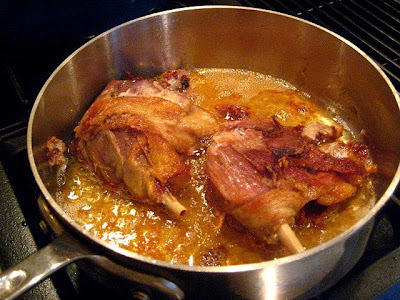 Toss liberally with olive oil, coating both sides & soaking up the olive oil. Toast on a cookie sheet in a 400 degree oven, about 5 minutes, keep an eye on them so they don't burn. 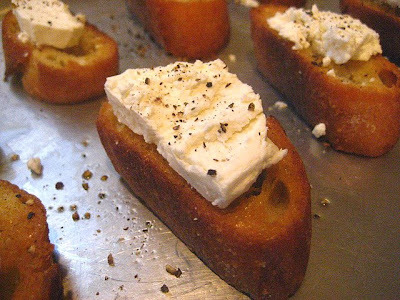 Turn your toasts over, and lay a round of sliced goat cheese on top of each bread slice & sprinkle with black pepper. Place back in the oven and toast with the cheese for another 5 minutes. Arrange your salad, duck legs and pear slices. 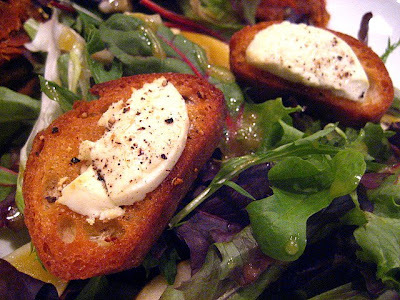 Pour dressing over salad and top with goat cheese toasts. PS This recipe won a $500 Chef's Choice Prize in the Ile de France Cheese Recipe Contest! Woohoo! That looks incredibly delicious. I've been seeing some duck confit at Whole Foods lately and this is some nice inspriation for things I can do with them. Yum. What a fantastic and fancy salad. The goat cheese on the baguette is calling my name. every time i come here you make something stunning. please feed me. I have been in the mood for duck ever since last week when I almost totaled my car swerving to miss one crossing the street from a nearby pond. Gotta love rural living. Think I'll settle for buying one already cleaned and ready for the pot. You make it sound easy and your photos make it look delicious!! "how you doin?" this looks goooooood! Duck Confit is one of the best things ever. Thanks for sharing. Sounds delightful. I haven't had much duck, I want to try more of it. Wow, what a sophisticated looking dish! Oooh, this looks so good. 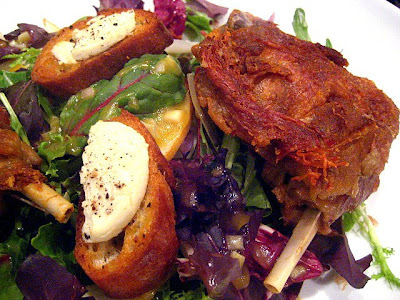 I've been able to buy duck confit at Costco of all places, I will definitely try this the next time I pick some up. Oooh la la. Almost like being in Paris. I've never bought duck confit - I didn't know you could buy it like that. Will have to give it a try. I love duck, but am intimidated by cooking it. Not sure why. This looks fantastic. Hope you are feeling better, too! What a beautiful dish. It's like having Paris anytime. Oh wow! Do you just keep a running order at European specialty stores, or was this for a special occasion? Looks incredible! The duck looks incredible and sounds great with the salad with pears! 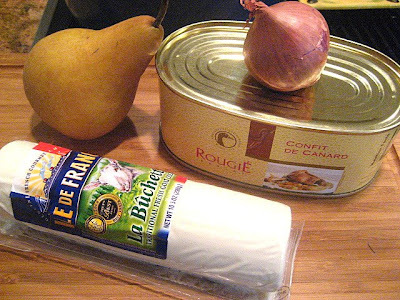 Wow, I've always wondered what duck confit in a can looks like. Looks great! It was all over the markets in Paris the last time I was there. As I was doing the online recipe search for a super special duck dish, this one stood out. It was the Anjou pear and toasted walnuts that got my attention with this recipe. I love that you used honey instead of loads of sugar. I just whipped up a pre-Christmas batch and I am now regretting that I made it so far in advance of the holiday because I don't think that I will be able to restrain myself from eating this, all alone in my kitchen, right out of the bowl, at every possible opportunity. It's positively delicious!